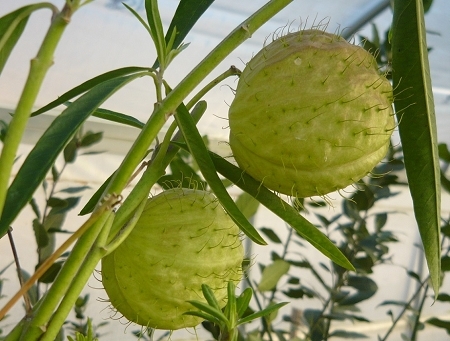 Balloon Plant Milkweed (asclepias physocarpa) - Also called Family Jewels Milkweed, Hairy Balls Milkweed, Giant Swan Milkweed. Unusual plant forms large rounded seed pods as the name suggests. Like other milkweeds, this is an important nectar and host plant for the monarch butterfly. Large plant can reach a height up to 4 ft. White blooms attract butterflies and other pollinators to the garden. Perennial zones 6-9. All parts of the milkweed plant are poisonous if ingested. Live plant in 3 inch container.